While at Trader Joe’s, I came across a container of sour cherries. They were gorgeous and I had never had them… so of course they came home with me. I am obsessed with trying new things. If I see something that looks interesting, I will buy it. I have yet to be majorly disappointed. 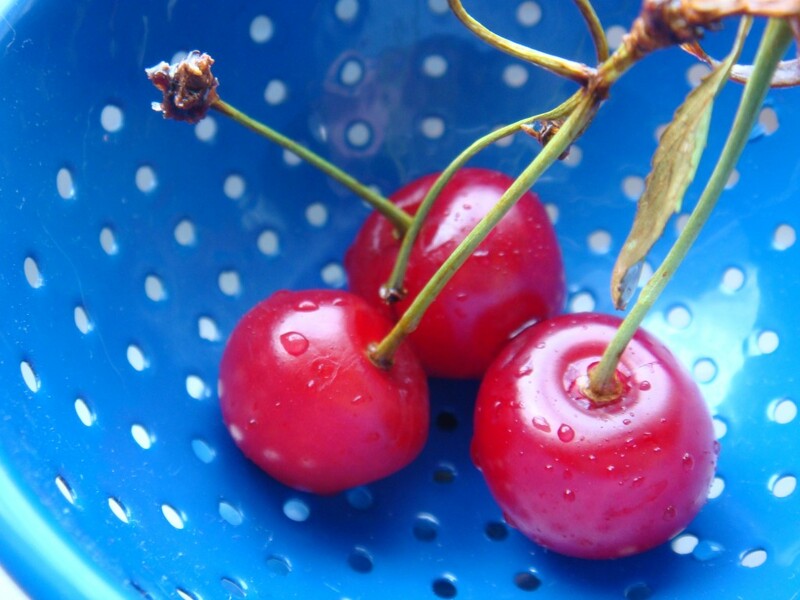 These cherries are smaller than your average black cherry or Rainier cherry. They are also softer and have a smaller pit. They taste somewhat sour, but not nearly as sour as I had assumed. I actually liked them. They sat in my refrigerator for a few days and then I realized if I didn’t do something with them soon, the $4 I paid for them would go down the drain. I did a bunch of Internet searches and found lots of recipes for cherry pies, jams and baked goods. 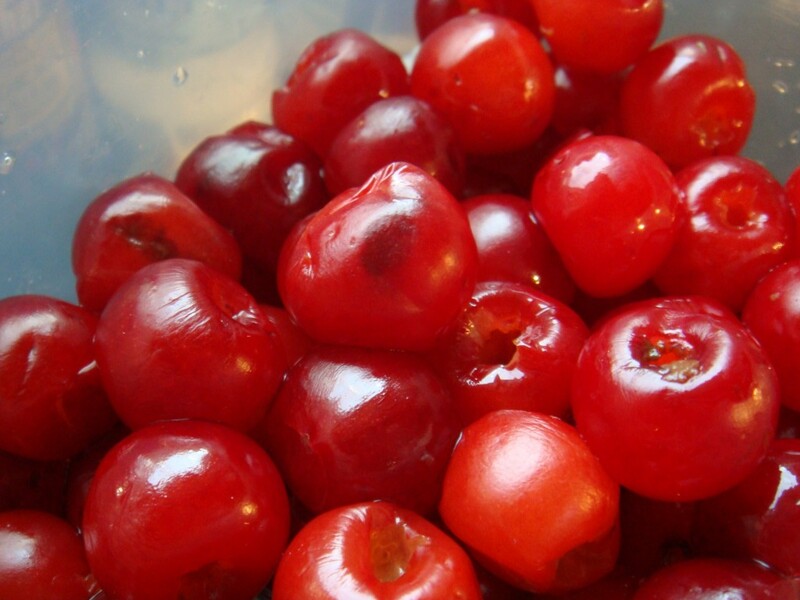 I thought about juicing them, as I love cherry juice, but hated to waste all that gorgeous cherry meat. As I stared at them thinking about what to do, a light bulb went off… Maraschino cherries!!! I had NO IDEA how to make them or even if you can make them, so back to the Internet for some searching. 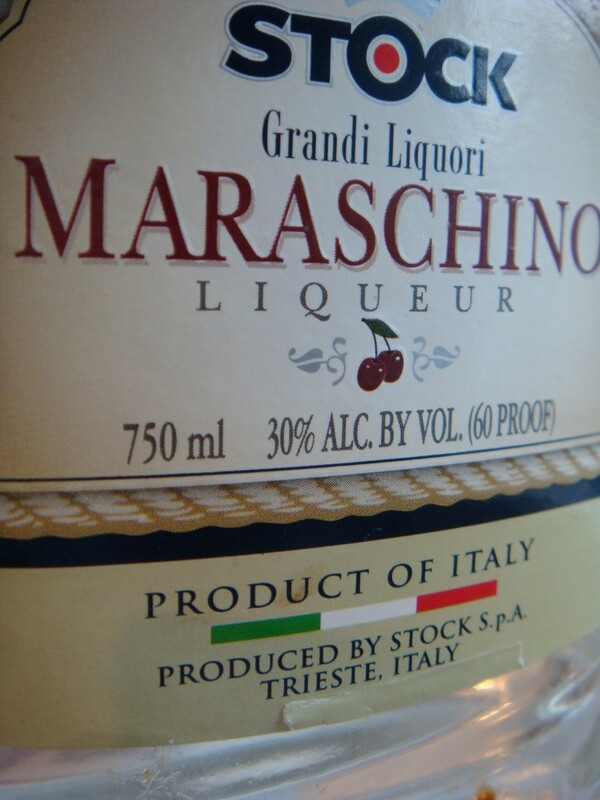 It seems there are two very distinct and different types of maraschino cherry recipes. The first is to make those cherries you buy in a jar… the sweet, firm, artificially flavored (almond extract) and colored ones. I love those and can eat them by the handful! The recipe is quite interesting though… it involves actually brining the cherries to remove the excess liquid and then soaking them in a thick, sugar syrup. While this sounded all fine and good, I’m trying to lose a little weight and having a large jar of sugar-soaked cherries laying around didn’t sound like the best idea. 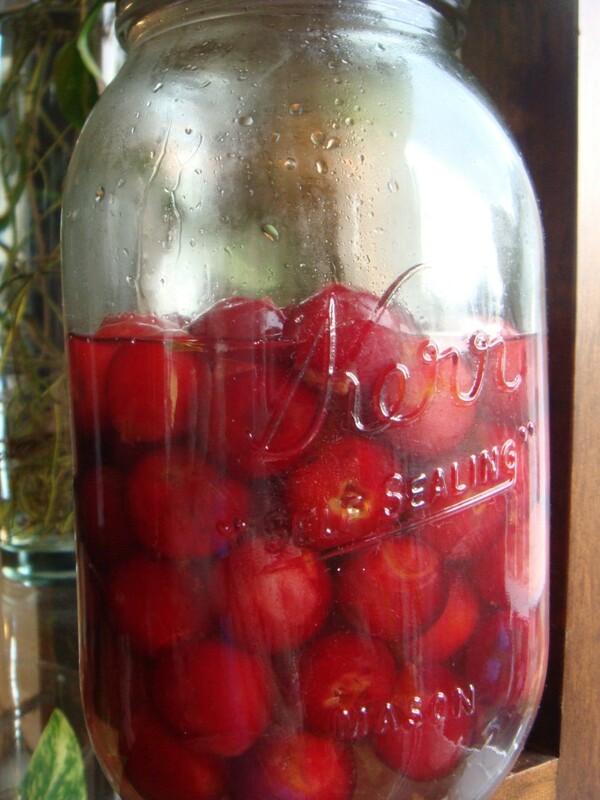 Then I came across an article in the New York Times about making homemade maraschino cherries (on a side note, I LOVE the NYT food section). It was a great story — about a woman that wanted to do the same thing as me! Make maraschino cherries, but not “those vinyl-textured, frighteningly neon and once potentially carcinogenic (remember red dye No. 2?) orbs.” I was intrigued! 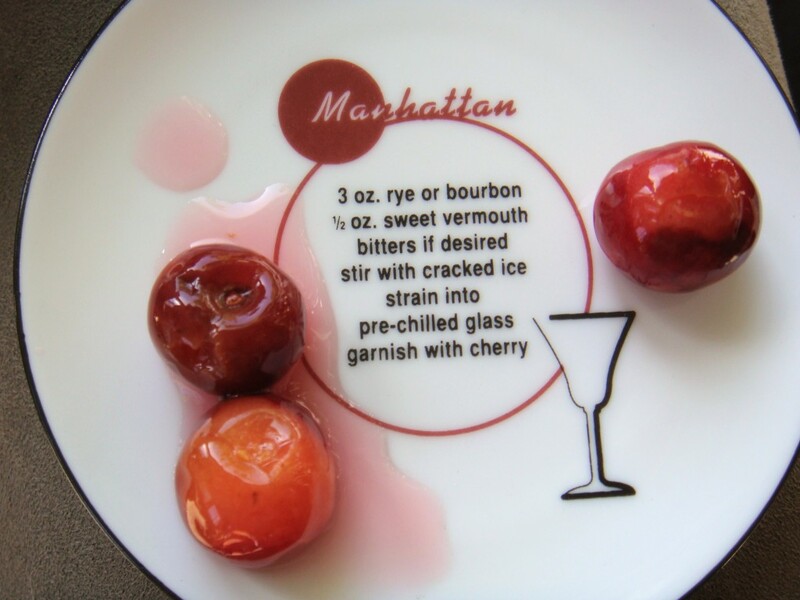 As it turns out, back in the bygone days, maraschino cherries were actually liqueur soaked and used as garnishes in classic drinks such as Manhattans and Rob Roys or used in desserts to give them an extra kick. The author of the article decided to try marinating her cherries in Maraschino Liqueur… and it just so happened that I (oddly enough) had this liqueur on hand! (it was a left over ingredient in one of the drinks my bartender served at my 40th b-day party) Lucky me! So I went to work. First I pitted the cherries using a must-have, essential kitchen tool, the cherry/olive pitter. I can’t live without this bad boy. I’m on my second one, as I broke my first from overuse I suppose. “is a bittersweet, clear liqueur flavored with Marasca cherries, which are grown in Dalmatia, Croatia, mostly around the city of Zadar and in Torreglia (near Padua in Northern Italy). Bring maraschino liqueur to a simmer in a small pot. 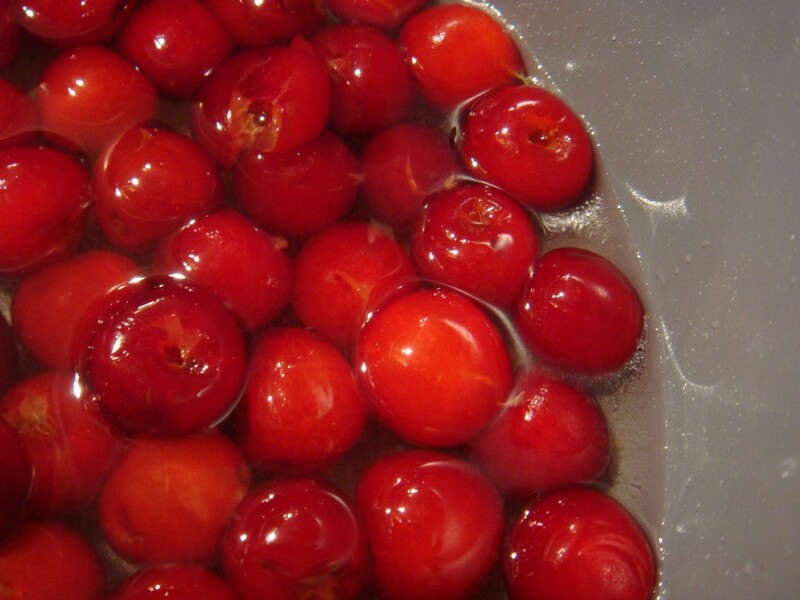 Turn off heat and add cherries. Let mixture cool, then store in a jar in refrigerator for at least 2 days before using, and up to several months. I heated up the liqueur, added the cherries and let them cool. I added the mixture to a mason jar and then tucked it away in the refrigerator once it was cooled. They are fabulous! They will definitely add a nice addition to any cocktail that calls for a cherry garnish. They seem to be a bit sweeter now, have a good texture and the maraschino liqueur adds a little kick without being overwhelming. I think I may need to try my hand at a Manhattan this week….